Authentic, natural Lodestone. Lodestones are rocks that are naturally magnetic. They are made of Magnetite, a type of iron ore. Magnetite itself is not necessarily magnetic. A piece of magnetite that is magnetic qualifies as a lodestone. 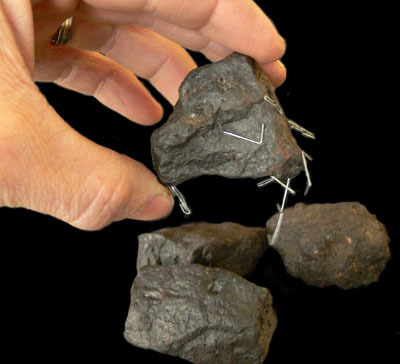 For a piece of magnetite to become magnetized it must be exposed to a magnetic field. The weak magnetic field of the earth is not strong enough so another source must be looked to. It is believed that lighting strikes on magnetite cause the magnetite particles to align in the right way to produce a magnetic field. In ancient times, pieces of Lodestone, suspended from a string so they could turn, were the first magnetic compasses used for navigation. The name Lodestone means 'leading stone' in Middle English. Throughout history people have attributed healing powers to lodestones. Even today many believe that magnets can cure certain ailments. Lodestones have long been sought after for many reasons. Many believe that lodestones have powers to affect their lives by attracting good things and absorbing bad. Lodestones are and have been used in spells and rituals or carried for attracting mates, for luck, for success, to absorb negativity, etc. For whatever reason you need a lodestone - even if you just want a really cool paperclip holder, these are great samples. Ideal for classroom demonstrations or learning about magnets. Unlike small 'thumbnail' samples found in rock shops, our Lodestone samples are substantial in size, each one measures about 2" long and weighs close to 1/2 pound. Easy for small hands to hold and inspect.